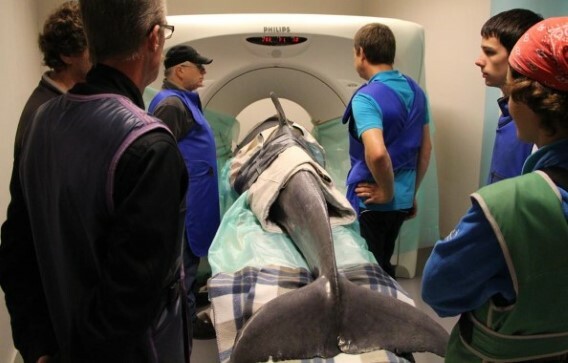 An article of the Flemish newspaper Het Nieuwsblad tells us that Beachie, the 31-year-old male dolphin at the Boudewijn Seapark in Bruges, had to undergo a CT-scan in October. The medical exam took place at the Causus Clinic in Oudenburg. 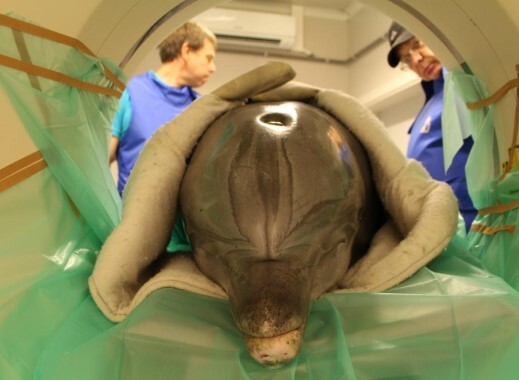 It seems the vet in charge, Piet De Laender, wanted to find out more about the age-related diseases amongst dolphins. For some time now, the trainers had noticed that Beachie was behaving differently. They contacted Piet De Laender (Assebroek), a veterinarian specialized in exotic pets in who regularly checks on the inmates of the dolphinarium. 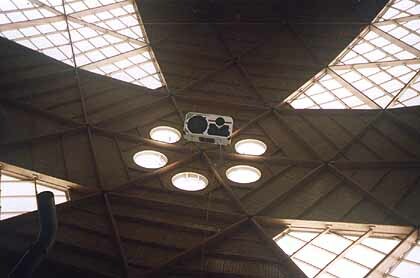 The dolphin was sleeping half of the time and was no longer able to perform jumps during the shows. 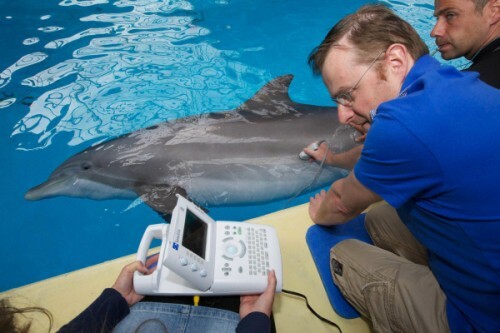 According to the vet, Beachie is also the 1st dolphin that has ever experienced this type of exam. He’s now waiting for the images before making a judgment about the health of his patient. As far as we can see on above video, CT Scan mainly focused on lunges and respiratory system. Waching with attention images of the video, it seems Beachie is completley stonned. He seems under tanquillizer. Not a move, not a thrill. But he is awake. “The success of this operation and this transport will be a model in the future to conduct health exams for all the dolphins”, concludes the vet, delighted. 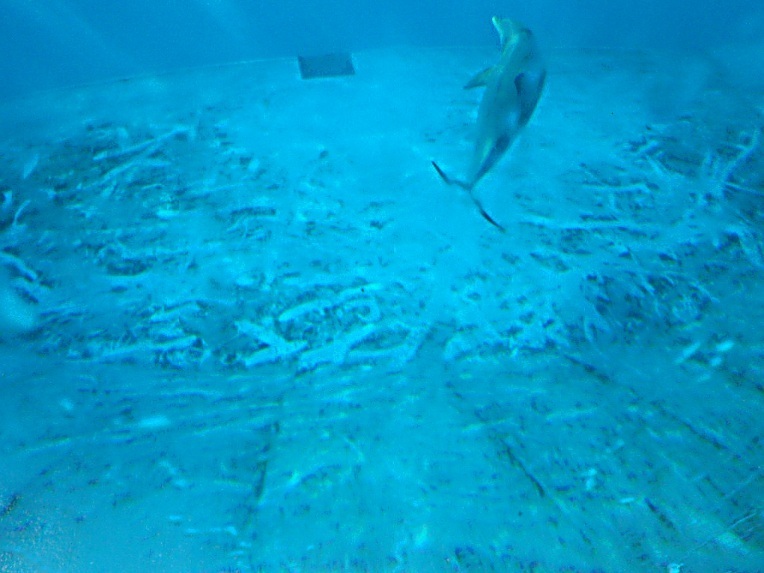 As for Beachie, he regained his pool and joined again the 5 other dolphins of the Boudewijn Seapark. This is, anyway, the well-oiled official discourse of Captivity Industry. It is clearly about transmitting to the public quite a few solid untruths. Starting with the classical staging of good vets and wonderful trainers, who are so concerned about the health of their protégé, Beachie. Just another old dolphin near to death. Beachie was born in the Gulf of Mexico around 1982. 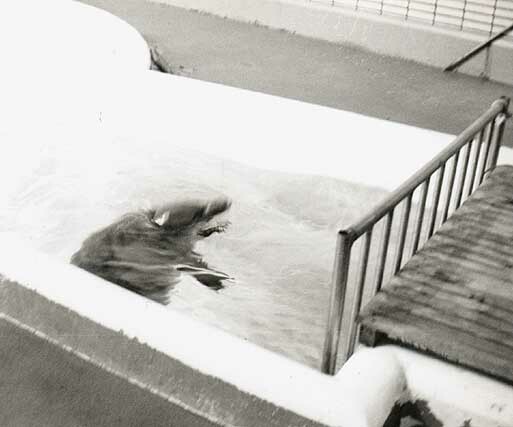 He beached and was “saved” by SeaWorld in April 1984, but he was never put back to sea. After staying in Orlando, he was deported to the Harderwijk dolphinarium in 1997 and then shipped towards Belgium on the 18th of September 2009, at the Boudewijn Seapark. His “mission” was to replace the previous reproductive male, Tex, who died tragically at the Marineland (Antibes – France), because of the EEP Programs. Beachie’s health was excellent until he arrived in Bruges. And Beachie was also a great stallion. In SeaWorld and in Harderwijk, he had given birth to Marbel, Sal’ka, T’lisala, Amtan, Palawas, Spetter and Kite, his last viable child, in 2005. Once he was moved to Bruges, he became the dad of only one stillborn child, removed from Yotta’s uterus in 2010, of stillborn twins from “old” Roxanne in 2011, and of one other child of Roxanne, a little boy who died 4 days after his birth in 2012. Since his transfer from Harderwijk to Bruges, Beachie was feeling lonely and sad. It was a shock for him. He suddenly found himself in a small, limited and dark environment. He was living in a sea pen under the sun and the wind in the Netherlands with several other males, and the poor Beachie had to learn new tricks, new ways to obey and to survive alone, isolated, along with aggressive dominant females and fearful juveniles, under the sinister dome of the Boudewijn Seapark. The air he was breathing was not the same either: the sea wind blowing on Harderwijk was replaced by a chlorine-loaded atmosphere, that takes you by the throat as soon as you enter the dark dome of the dolphinarium. Bad for your lungs when you are not used to it. The trainers all think he is a little crazy. He is difficult and only does what he wants. He is even called “the Mongolian”, because of his strange look, right in the orbits. Until recently, Beachie was receiving before each show up to 10 pills of Ciprofloxacin. Ten pills before the show, then 5 pills after and 5 more pills again for the second show. That is 20 doses of antibiotics a day. Ciprofloxacin (INN) is a fluoroquinolone antibiotic (second generation). Its spectrum of activity covers most of the pathogenic bacteria responsible for respiratory, urinary, gastrointestinal and stomach infections. In this case, the lungs seem to be the cause of the problem: Beachie’s breathing had been erratic and difficult for several months. Beachie: old ? At 31 years old ? However, according to NOAA (National Oceanic and Atmospheric Administration), the average age for wild dolphins is between 40 and 45 for males and more than 50 for females. It’s an average, because, in Sarasota’s bay, Nicklo has celebrated his 63rd birthday in 2013, and BlackDipDoubleDip his 60th. 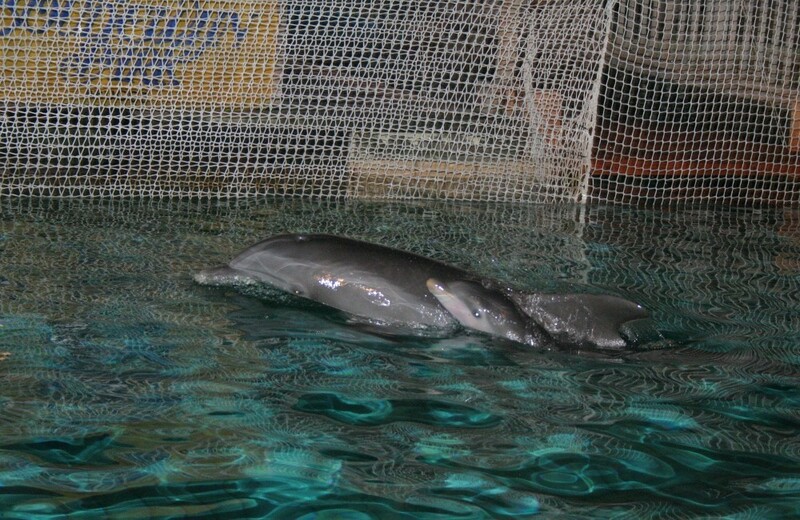 The fact that Puck is 47 is only exceptional because captive dolphins rarely reach that age. In Bruges, most of them died before 20. We’ll remember that, the same way, the death of Iris (aged 34) at the Duisburg Zoo had been explained by Dr Manuel Hartmann as a result of her “old age”. Iris had been living for almost 12 years in the wild before being plunged into the hell of the Antwerp Zoo for more than 18 years, alongside with her son Ivo. 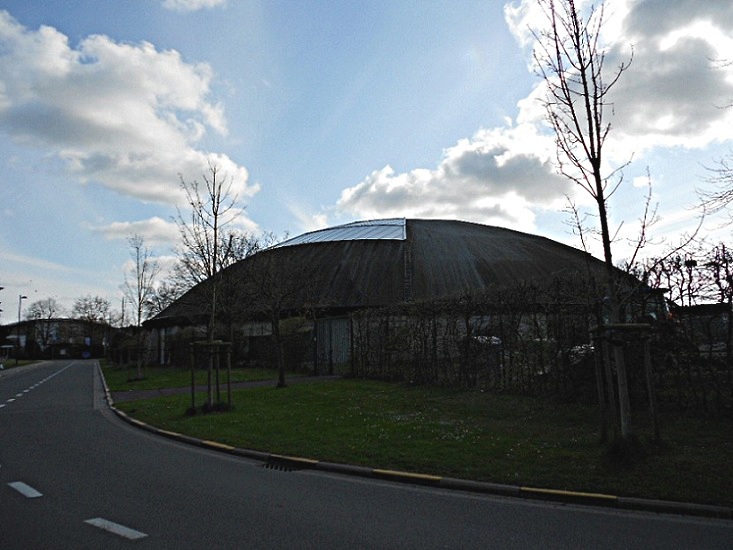 The Antwerp dolphinarium was closed in 1999, under the pressure of various associations, including Dolphin Project, and the two survivors were sent to Germany. The decline and the death of Iris in 2003 were atrocious but ignored and wrongly attributed by the dolphinarium and by a certain press to leukemia due to age. What they forgot to mention is that several factors drastically reduce the quality of life and the life even of the captives. They know it. But the show must go on. The federal commission for the welfare of the dolphins in Bruges, which has been now working for 3 years, will probably not say anything else when its findings will be made public and approved by the State. Beachie’s death will not change anything. He will be replaced, like he himself replaced Tex. Others will die again, others will be deported. Children will be taken away from their mothers, separated from them forever. A terrible pain, as dolphins are tied together with an intensity that we cannot even conceive. They suffer from boredom, and of course from the lack of space and occupations, but their body also suffers from the inadequate environment in which they are forced to live: frozen food, food additives, hydrating gels, meds, drugs, vitamins… Chemically salted water enriched with all sorts of substances and filtered by pumps day and night. At last, they suffer also from a nagging hunger that makes them obey and repeat 1000 times the same silly tricks in front of a misinformed public. The Boudewijn Seapark is a business indispensable to employment in the region. It benefits also from political supports. The whole case is tricky. Bruges is a Flemish town, and Christian, while Ms Laurette Onkelinx, the Minister in charge, is French speaking and socialist. So the leaders of the park seem to still have a bright future ahead of them, at least as long as this ultra-capitalist logic will prevail. 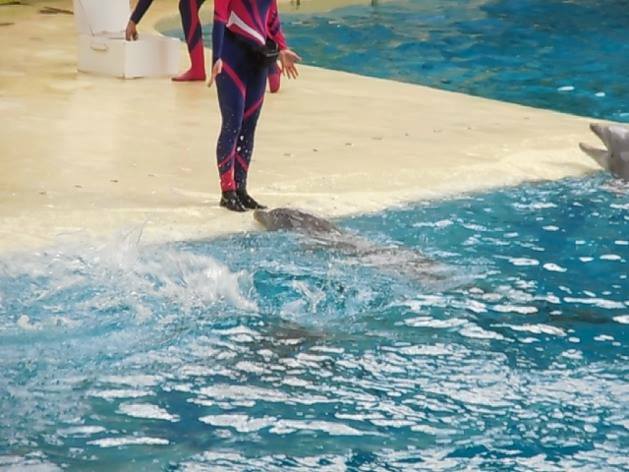 6th of November 2013: one anonymous person who just talked with someone at the dolphinarium has declared that Beachie was still sick but still had to take part to the shows, under very strong medication. If everything goes according to plan, he should also be joining the big Christmas show. And, according to another trainer in Bruges: “Anyway we still have enough dolphins”. 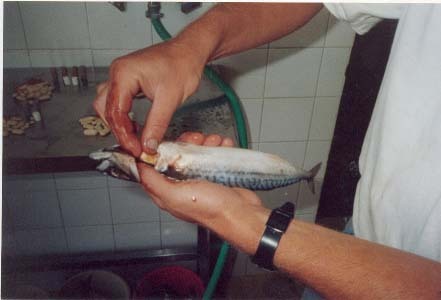 One of the things that Beachie had the greatest difficult to « learn » in Bruges when he arrived of Harderwijk (and before that of SeaWorld, and before that of the sea) it is to stand « at the foot » his trainer, stationary, while the other performed and were receiving fish for their work. 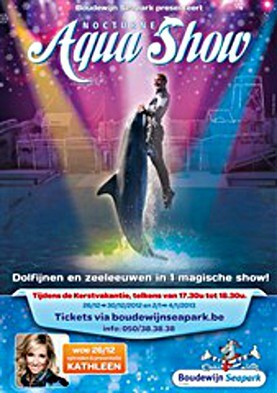 A technique of training specific to the Boudewijn Seapark which lack of space and must manage 6 dolphins in front in a single basin during the show. 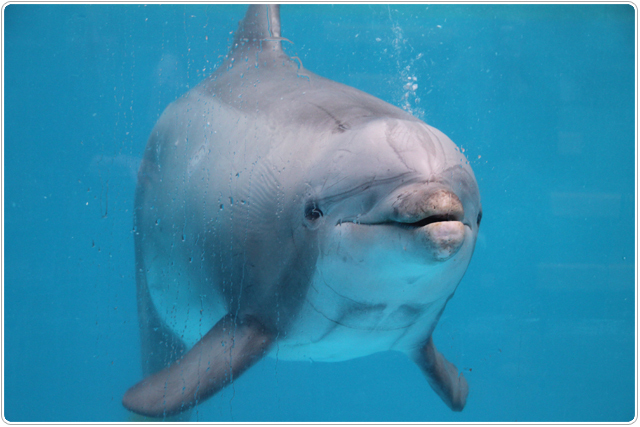 See the Dolphin on the right, open mouth, begging: hunger is a constant in all the dolphinariums. Cette entrée a été publiée le 09/12/2013 par yvongodefroid. Classé dans Belgique, Belgique / Belgium, Boudewijn Seapark, Bruges, Captivité / Captivity, Dauphins captifs, Delphinarium de Bruges / Bruges delfinarium, Divers / Uncategorized, Dolfijnen, dolfijnen in gevangenis, Europe et a été tagué Belgique, Boudewijn Seapark, Captive dolphins, Captivité / Captivity, cétacés captifs, dauphins de Bruges, Delphinarium de Bruges / Bruges delfinarium.